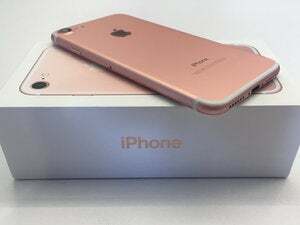 Back in June, Apple’s decision to limit third-party access to the iPhone to just Web-based applications —at least, for the time being—left some developers feeling shut out of what figured to be a very popular mobile device. But software makers love a good challenge. And once the iPhone came out, any ambivalence developers felt about having to build Web-based applications soon gave way to a wave of programs geared toward Apple’s smartphone. There are now hundreds of apps you can access through the iPhone’s Safari browser, everything from iPhone-like interfaces to existing Web sites to clever new ways of leveraging the best handheld computer platform around. Where to get started? You could scour places like iPhone Application List and iPhone Widget List, which contain links to the many varied iPhone apps out there. (A third site, iPhoneAppr, lets you browse for apps directly from your iPhone.) Or you could let us do some of the work for you—here are 10 iPhone programs that will give you a well-rounded look at the applications that are out there while also adding to the repertoire of what your iPhone can do. If there’s one complaint we hear constantly about the iPhone’s software capabilities, it’s the glaring lack of instant messaging support. Until Apple decides to bring iChat over to the iPhone, you can console yourself with BeeJive’s JiveTalk. This free web-based IM client offers the ability to log into multiple accounts over AIM, MSN, Google Talk, ICQ, Jabber and Yahoo. While it doesn’t offer all the functionality of a full-fledged client, it lets you skim your buddy list and chat, and that’s better than no IM at all. Gas.app lists nearby gas stations and their current prices. You’ve already spent at least $500 on your fancy new iPhone , so wouldn’t it be nice if it could save you some money? 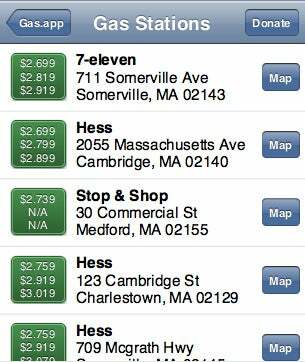 Load up Gas.app and punch in a ZIP code and you’ll see a list of gas stations from the surrounding area, complete with their current prices. Better yet, hit the Map key next to any gas station and the iPhone will pop up a Google map of the location, making it a snap to find your way to savings. The application is free, though its creators include a PayPal link for donations. If you’re on a budget, keeping track of your expenses is key to making sure you don’t exceed your means. While you can always hold onto your receipts to record them later, wouldn’t it be handy if you had an easy way to jot them down at the time? That’s precisely what MyBudge is for. Set up an account on the MyBudge site —it’s free—and you can track your expenses, complete with categories and defined spending limits. The main page keeps you updated on how much of your budget is left at any time, so you can keep a close eye on your spending. If there’s one class of app sorely missing on the iPhone, it’s games. Even the first iPod had a secret version of Breakout. But thanks to Pop Cap, you can still while away the hours by playing popular puzzle game Bejeweled. While it lacks some of the niceties of the full version of the game, like sound, the free iPhone version of Bejeweled retains the same addictive gameplay. Try to maneuver gems into rows of three or more, earning extra points for combinations. A hint button gives you a nudge if you’re stuck, but don’t forget to keep an eye on the timer. 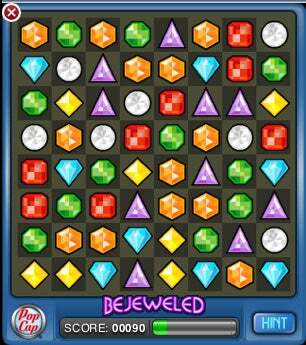 All work and no play makes for a dull iPhone user—fortunately, Pop Cap offers an iPhone version of Bejeweled. The iPhone’s quad-band GSM chip makes it a competent world traveler, but if you can get access to a Wi-Fi hotspot then it can become a handy travel assistant too, even if you don’t speak the language. Cool Gorilla has whipped up a free iPhone web app based on phrasebooks from LastMinute.com. Pick from French, Spanish, Italian, Portuguese, and German: each language features a variety of phrases arranged in categories like Food & Drink, Medical, Shopping, and Socializing. Even better, each phrase has an audio file that you can tap to play, so you can perfect your pronunciation. It’s the closest we’ve seen to a Universal Translator so far. The iPhone’s EDGE network isn’t as bad as many people would have you believe, but there are plenty of times when it’s no substitute for super speedy Wi-Fi. Even if you’re away from your home network, you can still find local Wi-Fi networks with JiWire’s free Wi-Fi Finder. Enter your location and choose whether you want to limit your search to free hotspots, or are willing to pay a fee to get online. JiWire will give you a list of places nearby with wireless Internet, along with a link to a map and detailed information about the location. When the iPhone’s own Weather widget won’t do, AccuWeather’s offering supplies much more meteorological data. The iPhone’s built-in Weather widget is fine for a basic forecast, but sometimes it’s a little short on information. What if you want a better estimate for when it’s supposed to rain this afternoon? Or what if you want to see a day outside of the widget’s six-day forecast? AccuWeather delivers on all fronts, for free, giving you the option of looking at an hourly weather breakdown, a 15-day forecast, and—coolest of all—an animated local radar. And, like the iPhone’s built-in widget, you can store multiple locations and switch between them with the tap of a button. Sure, you could jot your shopping list down on a piece of paper, but that’s so last century. Thanks to Neven Mrgan’s free OneTrip, it’s a snap to use your iPhone to plan your next trip to the grocery store. It divides up your provisions into multiple color-coded categories: fruit, for example, is orange, veggies are green, and meat and seafood are red. Each category contains a list of common items, though you can add your own as well; OneTrip will even remember them for you in a special “Saved Items” category next time you visit. Tap an item to add it to your list, then you can check it off once you’ve popped it into your basket. 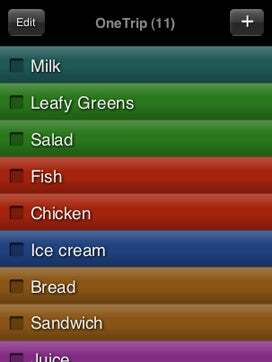 OneTrip’s color-coded interface helps you keep your grocery list on your iPhone. Microblogging phenomenon Twitter and the iPhone would seem to go together like cream and sugar, so it’s little surprise that there are already a handful of Web apps for interfacing with the popular social networking service. Among them, the free iTweet is probably my favorite: It’s a slick-looking app that has plenty of options built right in. You can easily view the public timeline, reply to a friend’s tweet, or see direct messages. Best of all, it provides easy access to replies, including messages addressed to you by people you’re not actively following. Strictly speaking, Remote Buddy is only partially an iPhone app. The €20 program was initially designed to allow you to use the Apple Remote with other applications, but it’s since expanded. Now it builds in iPhone functionality, allowing you to control many aspects of your Mac from your iPhone. Besides the old standby of managing iTunes playback, you can use Remote Buddy on your iPhone to run Keynote presentations, play DVDs, even type on your Mac via the iPhone’s virtual keyboard. Plus you can control any of the apps that Remote Buddy supports with its extensible architecture.